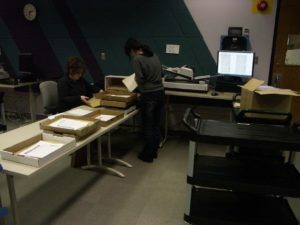 When I worked at Library and Archives Canada (LAC), I was aware of the Lest We Forget Program and the work being done to introduce students to working with archival records, but it wasn’t until I made the switch to a municipal archives that I was able to be personally involved. Over the past three years, I have run an expanded version of the program with six different classes at Douglas College in New Westminster in partnership with Dr. Ashleigh Androsoff (now part of the faculty at the University of Saskatchewan). For most students, this is the first time they have ever worked with primary source material. The brainchild of Blake Seward (a history teacher from Smiths Falls, Ontario), the Lest We Forget Program was delivered initially onsite at Library and Archives Canada in Ottawa. Teachers would bring their classes to the reading room and students would consult the original documents. While this would have been profoundly moving, it did not enable students from other parts of Canada to have the same experience. 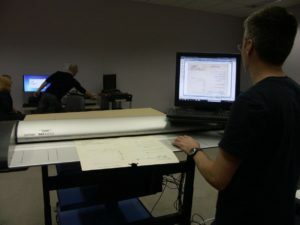 As part of its commemoration efforts, Library and Archives Canada committed to the digitization of the 640,000 service files in its collection. Throughout the process, progress has been documented on LAC’s Discover Blog and as of October, more than 347,000 files have been completed and made available online. The digitization project is expected to be completed by 2018. The photos below are part of a series from LAC, showing parts of the digitization process. The rest of the “Vault to Screen” images can be found on LAC’s Facebook page. In order to complete the digitization, LAC staff had to remove hundreds of thousands of brass fasteners that held the files together. This is something I never would have considered, but what do you do with all of these fasteners? LAC turned to artist Sarah Hatton to give them a new life. Over the course of a year, Hatton created a stunning tribute to the soldiers who served in the Canadian Expeditionary Force. She researched historical star maps to determine what the night sky would have looked like on the night after each prominent Canadian battle (e.g. First Battle of Ypres, the Somme, Vimy, Passchendaele, and the Second Battle of Ypres). Each file’s fastener was stamped with a star and painstakingly attached to a black cloth to represent one star in the night sky. Hatton called the series “Detachment” and explains that “Detachment honours the lives lost during the First World War and reinforces the enduring importance of collective memory on its 100th anniversary. 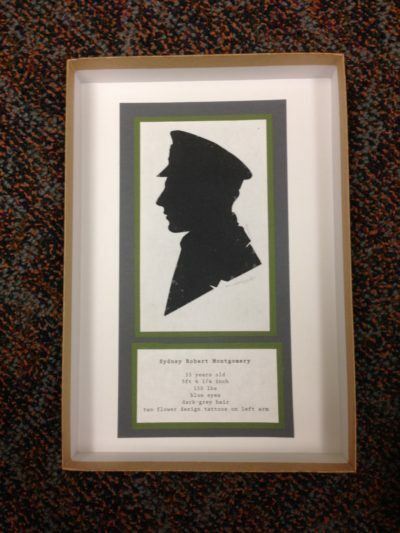 These artworks are made from thousands of historical brass fasteners that once held together the military records of the Canadian Expeditionary Force.” To see a video about the making of her incredible art, visit her Facebook site here. The digital distribution of service files through the Personnel Records Database has meant that the Lest We Forget program can be more easily delivered to thousands of students across Canada. The pedagogical potential of this program is limitless. 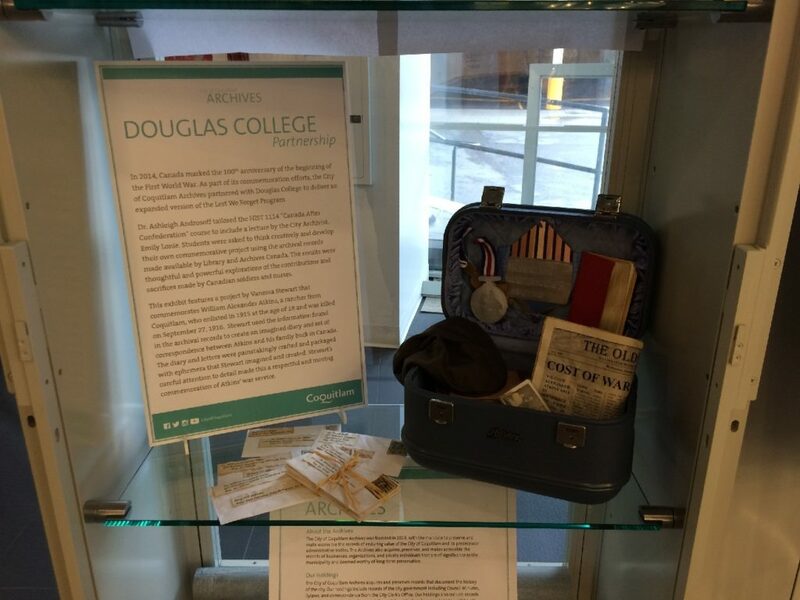 In our case, Dr. Androsoff and I adapted the LAC program to include a creative commemoration project. 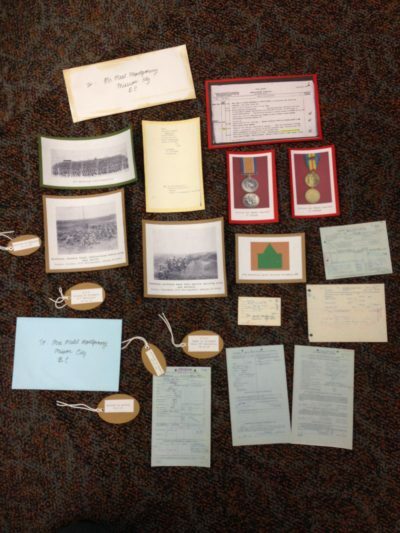 Students were asked to review the military service file of a particular soldier or nurse, as well as the Virtual War Memorial and archival documents such as War Diaries, Books of Remembrance, and Marriage, Birth, and Death Registers. They were asked to reflect on the life and service of their chosen individual and to develop a public commemoration. The format of the creative aspect of the project was open-ended. Students were limited only by their imaginations. Some of the extraordinary work that was completed can be seen in an exhibit now on display at the Coquitlam Public Library. A selection of images of the exhibit are available on the City of Coquitlam’s Flickr page. Here’s me talking about the display on Shaw TV (don’t you just love how videos pause with such flattering facial expressions?!). 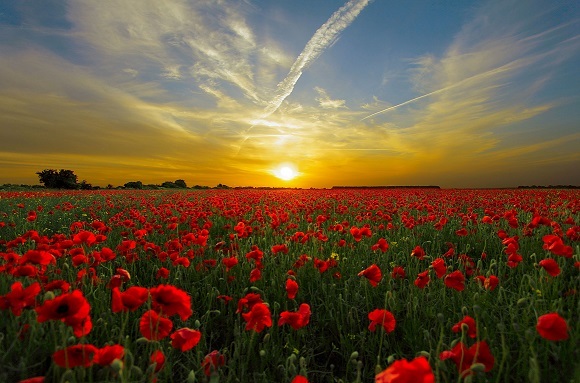 I have had such a wonderful experience with this project so I decided to ask Dr. Androsoff about her impressions, to get a sense of the educational value of the Lest We Forget program. Question #1 – Do you feel the students responded favourably to the project? If so, are you able to provide some examples of how students responded to the project? 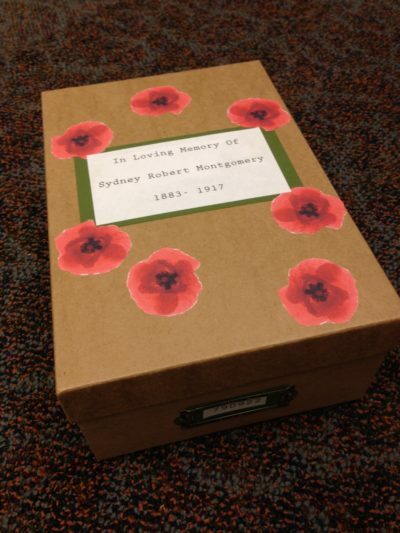 After completing this project, most students volunteer that they loved doing it: they really got into the archival research, and connected with the history of the First World War in a far more personal way than they had anticipated. Most students submit their projects with a great deal of pride, and their submissions demonstrate engagement with the material in question. The first time we ran the project, we noticed that many students had selected the same soldier, but we could not figure out why. Following Emily’s suggestion, we required students to submit a one-paragraph explanation of why they chose their particular service person. We observed that a broader diversity of service people were represented in students’ projects once we implemented this requirement. Some students explained in their rationale that they were looking for a particular detail: someone who had been injured, for example. Others indicated that they were interested in finding someone representing a specific ethnicity or social background. It seemed as though requiring students to explain their selection prompted them to dig a little deeper and reflect on their choice. Question #2 – How do you feel the project enhanced the students’ knowledge and/or understanding of the subject matter? This project encourages students to integrate at least three layers of engagement with the historical subject matter. 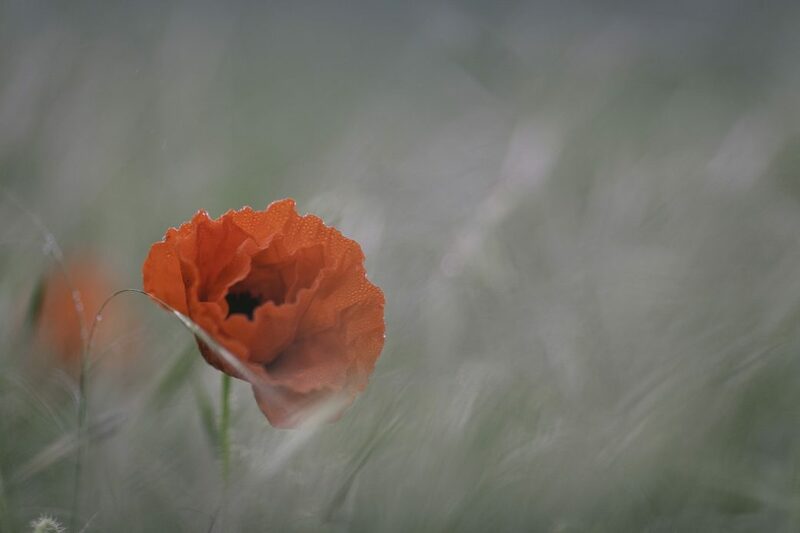 The Lest We Forget Project encourages students to make a personal connection with the material, by getting to know just one soldier or nurse through his or her documentary record, and then putting that particular service person into the broader historical context. If the soldier’s record indicates he was hospitalized with sepsis after Vimy Ridge, the student can use what he or she learns from the secondary source material, or from lecture, to try to imagine what that soldier’s experience in the battle, or in the hospital, might have been. This exercise personalizes the material, but it also serves as a reminder of how little we actually know about the experiences of the past, and of how difficult it is to recreate that experience with only a few documents to depend on. One of the objectives Emily and I shared from the start was to demonstrate to students how exciting – and sometimes frustrating – archival research can be: the thrill of finding “the missing piece,” and the frustration of being unable to read it, either because of obscure handwriting, the deterioration of the document, or poor reproduction quality. 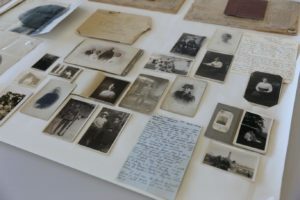 The learning outcomes for this project extend beyond reconstructing the experiences of particular veterans, and beyond understanding World War One. Students also get a taste of what considerations might go into the production of creative representations of the past (films or novels, for example) or into public history (museum installations or memorials, for example). In this project, students are encouraged to think about how we interpret past events and present them to others. Question #3- Is there any advice you would provide to others thinking of undertaking this project? I began to assign creative projects as a way to offer students an alternative to the traditional essay or exam forms of evaluation, which are not necessarily well-suited to students’ strengths, interests, or needs. I encourage students who express doubts about their creativity to begin by identifying their interests and skills, and developing a project deliverable around the tools they already have in their kit. “I don’t have any interests,” one student said to me, “all I like to do is play video games.” “Fine,” I answered, “then story-board a video game for this project.” Usually the response I get is something like: “you mean, I can do that? That would work?” Yes! On the other hand, one of my students who was in the Army Reserves chose to write up a pamphlet about his soldier as part of a Remembrance Day event, which included a tour of the Armory and highlighted the soldier’s life and service. It seems to relieve some anxiety when I reassure students that I’m not expecting them to be proficient painters, poets, or musicians (though some of them are). Rather, I am looking for thoughtful interpretation of solid research, presented using an interesting and neatly-executed creative concept. Some instructors have asked me how difficult it is to evaluate these kinds of projects. Evaluating these projects is relatively straight-forward and enjoyable, in my experience. Instructors will find that they will be able to distinguish excellent from good projects, and good projects from mediocre projects, based on the quality of the research the students have completed, the rationale they have provided, and the overall impact of the project deliverable. I have not had any student question the outcome. I was struck by the enthusiasm shown by the students for the archival materials. This was not a boring assignment for them. On the whole, they embraced the material and created incredibly moving public commemorations. Students were able to make a meaningful connection with a soldier or nurse from the past, understand a bit about their lives, and compare their experiences to present day. 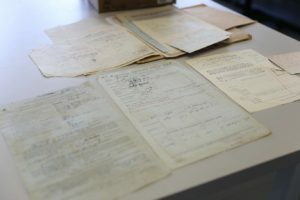 Watching students connect with the past through the archival records has been an incredibly rewarding experience for me and is precisely the reason why I believe that archives matter. Archives provide the connections to the past that help to create meaning in the present. I am so pleased that I was able to share this with a new generation of researchers through the Lest We Forget program.